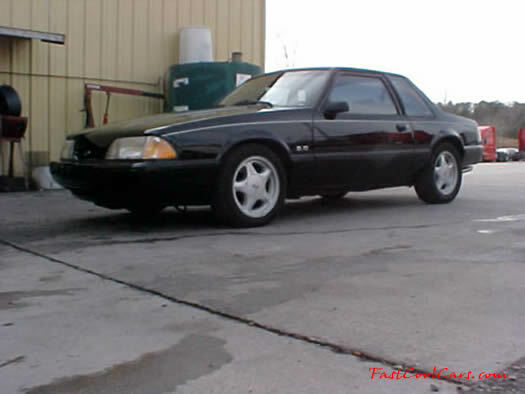 1991 LX Mustang coupe - This is a very cool ride. It has the 5.0 H.O. with a 5 speed, one of the best combinations in my opinion. I think the coupes are better looking then the GT's, not to mention that there are so many GT's out there, but not many 5.0 coupes, especially with a 5 speed. Everyone knows that they are much lighter. Mine is black with black cloth interior. Power windows, and door locks, air conditioning and heat of course. I think a above head map light is the only other option, not even rear window defroster. A very cool notchback Mustang for sure. Clear rear tail lights, and corners. It also has red LED tail and stop lights under the clear covers. It has a aluminum drive shaft that was installed not long before I got it. MAC chrome cold air intake, and K&N air filter, crank underdrive pulley, MAC off-road H-pipe, Dyna-flow 2 chamber mufflers, and polished 2 1/2" dual tailpipes, they look and sound great on a notch back. 16 inch, 5 star pony wheels.